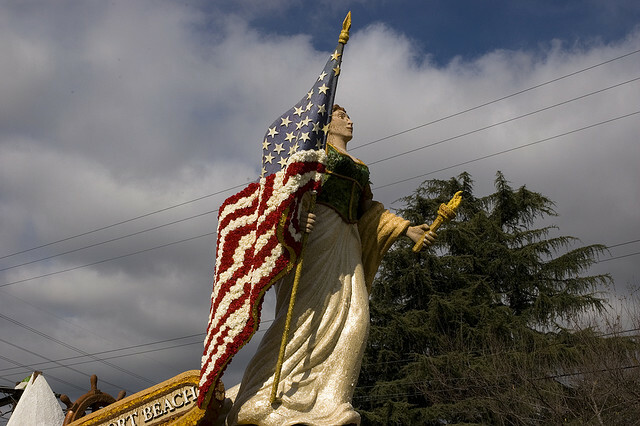 Flags flutter behind the Rose Parade sign in 2012. Photo by Prayitno. 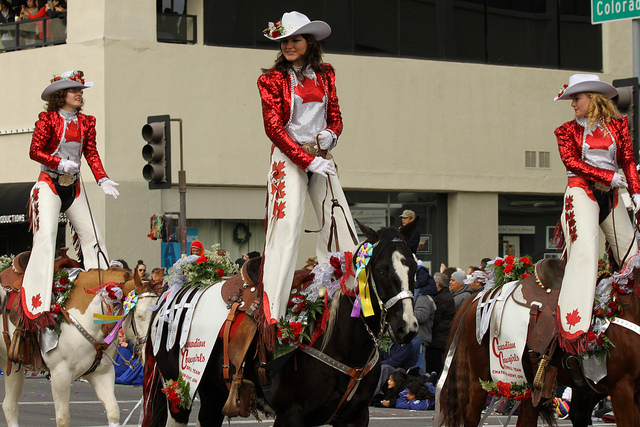 This year, like every year since 1890, Pasadena California will see brightly color floats, marching bands, equestrian units and all the pomp and circumstance that the United States can muster. 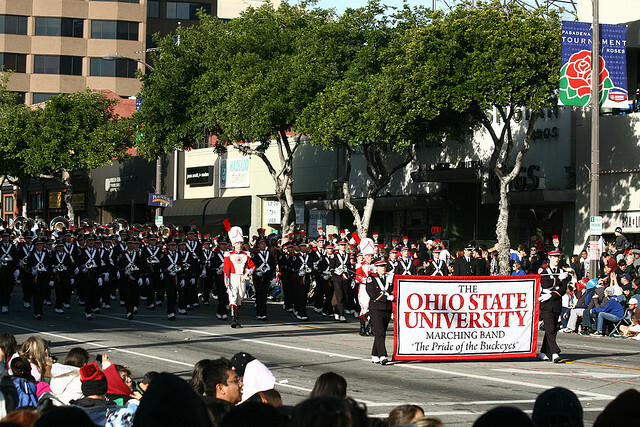 The Rose Parade is a celebration and a welcoming of the new year, and with it, new possibilities and new beginnings. 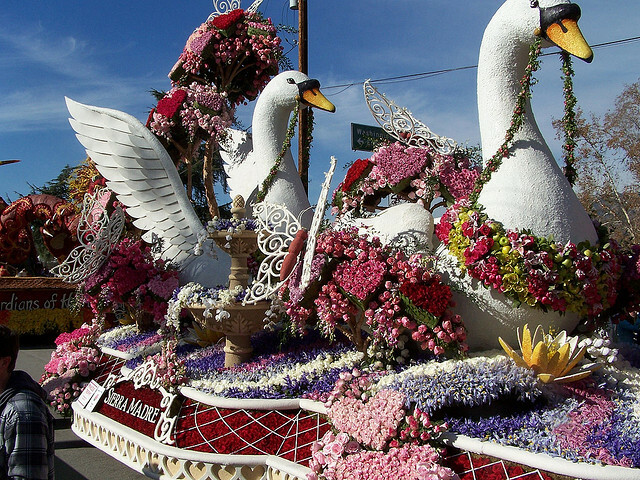 Parade floats are adorned with flowers and botanicals of every color, shape and size. The rule is that all floats are to be covered in natural materials. Besides the flowers, you’ll see whole plants, seaweeds, seeds, bark, vegetables, beans, and nuts. Not a single artificial flower or plant will be allowed, nor can the materials be artificially colored. 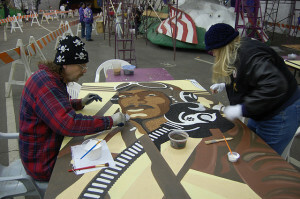 These rules keep the last minute preparations exciting even though the floats take up to a year of planning and building. 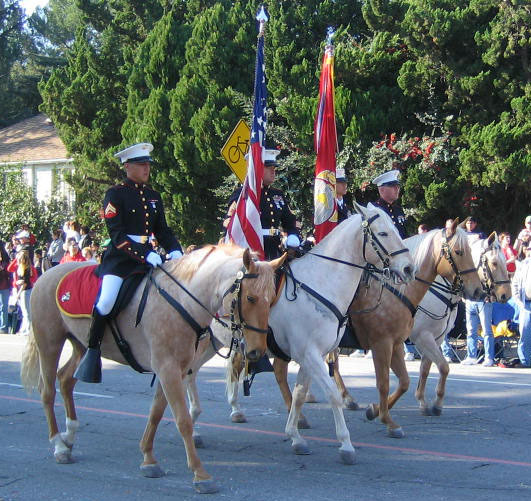 Mounted equestrian units like the US Marine Corps Color Guard and the Canadian Cowgirls will break up the floats with beautiful horses, uniforms and flags. Each year has it’s own parade theme and a new Grand Marshal. It is organized by the non-profit group, Pasadena Tournament of Roses Association. Following the parade is the Rose Bowl, a college football game added to the yearly program in 1902. Marching bands, with their bright lead banners and tasseled hats, will keep your toes tapping with traditional marching songs and newer songs adapted to keep with this year’s theme. This year’s Grand Marshal is Louis Zamperini, an American World War II prisoner of war survivor and Olympic distance runner. Appropriately, the theme is “Inspiring Stories”. Each float or marching unit will be sharing their version of the theme and will be judged on their presentation. An interesting twist this year, is that the Grand Marshal, Mr. Zamperinin, passed away this summer. The only other Grand Marshal to have been honored posthumously by the Rose Parade has been baseball player, Jackie Robinson in 1999. Only about 700,000 lucky people will get to see the parade live but tune in on one of many TV stations to see the beautiful floats, marching bands and equestrian units this year. 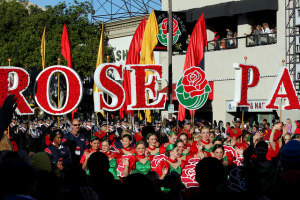 Here are a few of my favorite photos of past Rose Parades. 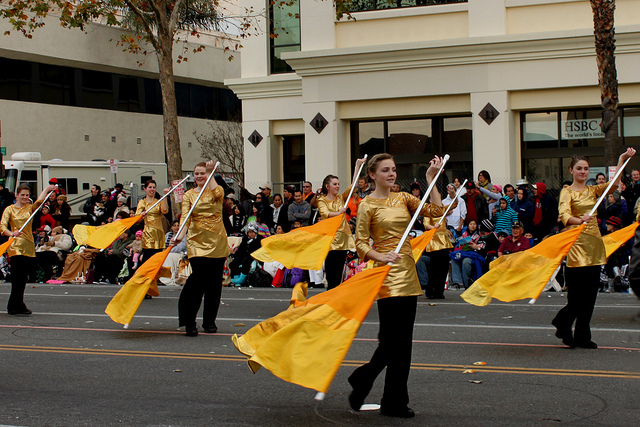 Davis HS Color Guard from Kaysville, Utah waves colored flags as they march in the 2013 Rose Parade. Photo by Prayitno. I am trying to find a California rose parade flag for my house. Can not find a source. Do you sell them? If not. you should. Gary, we don’t offer that flag but I did do a little research on it. 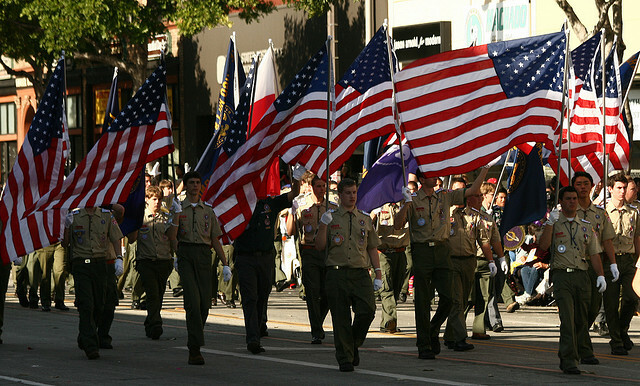 It seems that the presentation of a rose parade flag is an honor set aside for certain figures or groups that are in the parade each year. I’m afraid it’s not a design that is meant for the general public although you could contact the parade committee to see if they have any recommendations for you. If you can get permission to use the logo for a flag, we could make it as a custom item for you.